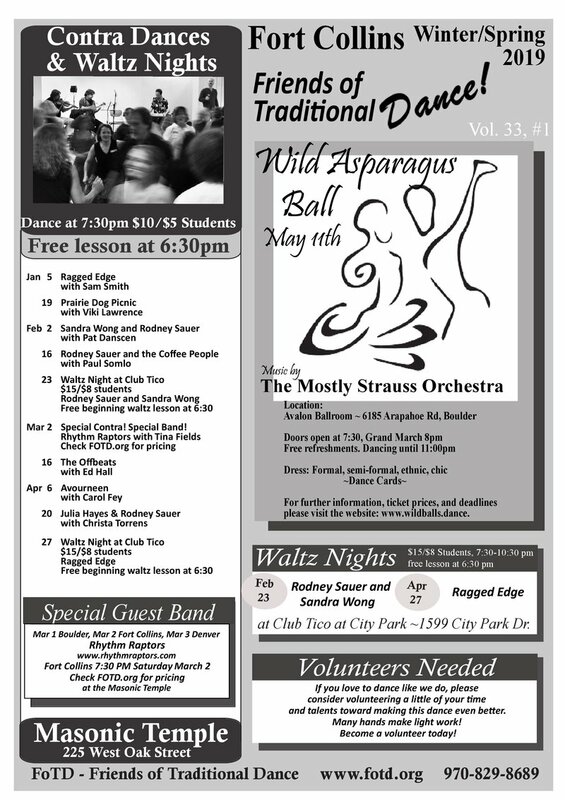 $10 ($5 students) for contra dances, $15 ($8 students) for waltz nights (note cost for specials). Download our typeset Winter 2019 Calendar (Adobe Acrobat PDF format). Get information about CFOOTMAD dances CFOOTMAD DANCES. Disclaimer: Sometimes there are last-minute dance cancellations or venue changes. This web site maintains the most current information for all the FoTD events listed above. However, if you will be driving a long distance to a dance or if you have reason to suspect an event may have been cancelled, rescheduled, or relocated, please contact the hotline to get the latest information. Guest Callers Welcomed! If you are a contradance caller and you will be traveling to or through the Front Range/Fort Collins area, we would love to have you as a guest caller at one of our dances. Send an e-mail to FoTD@FoTD.org or call the FoTD hotline at 970-829-8689 so we can coordinate scheduling.